The Beatles’ Yesterday is allegedly the most covered song of all time, The Righteous Brothers’ You’ve Lost That Lovin’ Feeling is the most played song on US radio of all time and the most played song on UK radio is Procol Harum’s 1967 anthem A White Shade of Pale. 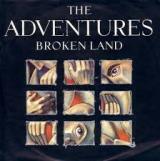 This week’s subject is a song that only reached number 20 in the UK singles chart, but it was the most played song on Radio 1 in 1988, that song is Broken Land by The Adventures. They were formed in Belfast in 1984 and comprised; lead singer Terry Sharpe, Pat Gribben and Gerard Murphy (known as Spud) on guitars, Tony Ayre on bass, Pat Crowder on drums and Pat’s wife Eileen on vocals. So where did it all start? Well, Terry had studied at RADA (The Royal Academy of Dramatic Arts) but was persuaded by Pat to give it all up and join his band, The Starjets. This he did and after their only minor UK hit War Stories, the band folded. Murphy used to be a roadie for both the Boomtown Rats and Stiff Little Fingers, whilst Crowder used to be a drummer for a British singer called Philip Jap who came to prominence, albeit briefly, after winning the dreadful David Essex Showcase talent show. Philip’s musical career last just a couple of minor hits, but he’s actually still in the business running a company called AUDIOfield who specialise in music supervision and production. They were spotted by Simon Fuller, who would be better remembered for breaking the Spice Girls a decade later, who secured them a recording contract with Chrysalis Records. A year later they moved to Elektra Records but despite Simon’s backing they never quite achieved a significant commercial breakthrough. It was possibly down to the producers. According to the sleeve notes on their debut album Theodore and Friends, a title of which was inspired by the John Wyndham science fiction novel The Midwitch Cuckoos, there were three different producers involved. Pat explained, “The producer thing was a pain really. Each brought something different to the gig. Garry Bell was a joy to work with, but the truth is that Steve Lipson was down to make the record but due to his commitments to Frankie goes to Hollywood the album kept being put back until we gave up on him and went with the three documented. I don’t want to knock what happened, but Steve was red hot then and would have been perfect.” The album was promoted to coincide with a tour where they were supporting Tears For Fears, but that wasn’t enough to spark enough interest to create sales. The band first hit the chart with Another Silent Day (No.71) then followed it with Send My Heart (No.62) and Feel The Raindrops (No.58), following a change of label to Elektra, it was their fourth single, Broken Land, which made their name and reached number 20. That song was inspired by The Troubles in Ireland in the 1970s and 80s. The Troubles refer to a violent thirty-year conflict beginning with the civil rights march in Londonderry on 5 October 1968 and ending with the Good Friday Agreement on 10 April 1998. It was a territorial conflict, not a religious one. Their final single, after Broken Land, was Drowning in the Sea of Love which only reached No.44. In February 1990 they released another album called Trading Secrets with the Moon which the fans adored but again, not enough sales to get it any higher than number 64 in the chart. They changed label yet again and, in 1993, signed with Polydor records and released their final album, Lions and Tigers and Bears, and name given by Pat and Eileen’s second daughter. It had some quality tracks on it including an excellent cover of the Mamas and the Papas 1966 hit Monday Monday but the sales were poor and the band stop recording together and touring. They have however played a few gigs since including The West Belfast Festival in 1997, The Empire in Belfast twice in 1998 & 1999 and BelFest, Morrisons in 2000. Pat and Terry both went on to play in a band that went under the names Electric Bananas and The Dead Monkeys. Pat is still writing songs and working with Irish singer Ryan Molloy. fantastic choice … I caught on to them in 1984, just after the first single “Another Silent Day” – which I bought on 12 inch pic disc, then the brilliant single “Send My Heart” – again heavily promoted by Chrysalis with loads of ltd editions – the usual 7 and 12 inch singles, plus a double pack, and a metallic looking silver vinyl copy … yet it still didn’t get very high in the charts. There’s an American version of the “Theodore & Friends” album, just called “The Adventures” – most tracks are on both, but the US version uses different mixes – that version of the album is impossibly rare, and has never been issued on CD. They only made 4 albums in total … but had a long run of great singles – but hardly any of them made much of an impression on the UK charts … clearly Simon Fuller wasn’t so good at hyping acts then!